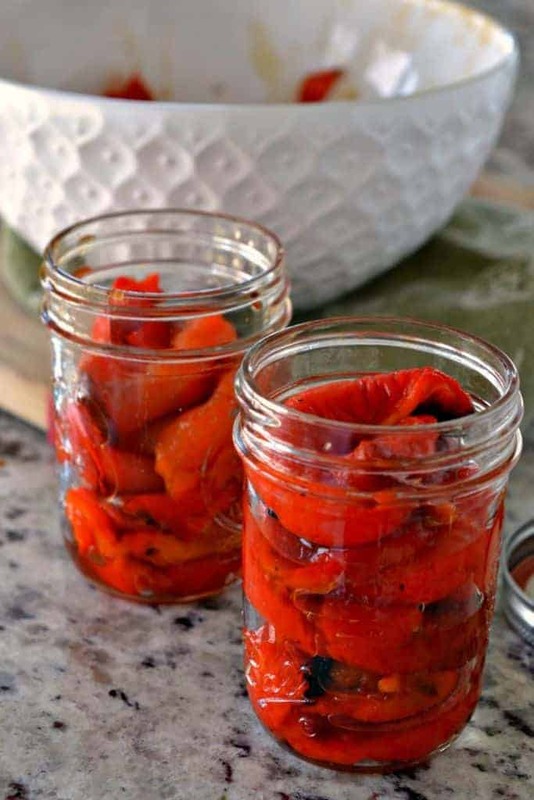 Fresh Roasted Red Peppers are so easy to make at home. These preservative free peppers are bursting with sweet flavor and zest. You can store in an airtight container for use throughout the week in salads, sandwiches and wraps. These fresh roasted peppers are all that and more. With just a little effort you can have fresh roasted peppers in your kitchen at a fraction of the cost. The summer growing season will be upon before we know it. Take full advantage of the season and roast yourselves some fresh red peppers. They taste so incredibly delicious and can be used in a variety of recipes. How to Roast Red Peppers? First cut the red peppers in half from the stem side down. Remove the seeds and membranes and place cut side down on a baking sheet covered with parchment paper. Place in the oven and roast for 15-20 minutes or until blistered and black. Remove from the oven and place in a bowl covered with plastic wrap. Let them cool for about 30 minutes. Carefully pinch some of the skin and pull up on it. Once there is a break in the skin it will peel easily. Discard the peels, cut the roasted red peppers in half. Store in an airtight container with a little bit of olive oil drizzled over the peppers. What is the difference between red, orange, yellow and green peppers? They are all essentially the same pepper in different growing stages. In it’s earliest stage the bell pepper is green. If left on the vine to fully ripen it will change to yellow, then orange and finally red. This fully explains why green peppers are the most economical as they can be harvested earlier. Red peppers are allowed to fully ripen resulting in a sweeter fruitier flavor. Red peppers have twice as much vitamin C and nine times for beta-carotene than their green cousins. Always preheat the oven. The oven should be at optimum temperature for at least five minutes before roasting the peppers. Don’t crowd the baking sheet. Leave space for the heat to get around the peppers. Most parchment paper is good up to 420 degrees Fahrenheit. I have never had an issue with it. However if concerned use aluminum foil. Stay close by and monitor the situation. Let the peppers rest with plastic wrap, aluminum foil or even a clean kitchen towel over the bowl for about 30 minutes prior to peeling. For roasting on the grill cut the peppers in quarters and preheat the grill to medium high heat (about 400-450 degrees.) Place peppers skin side up and cook until blistered and black or about 20 minutes. Rotate peppers to cook evenly as there are hot spots in every grill. Place in a bowl covered with plastic for 30 minutes and then peel. 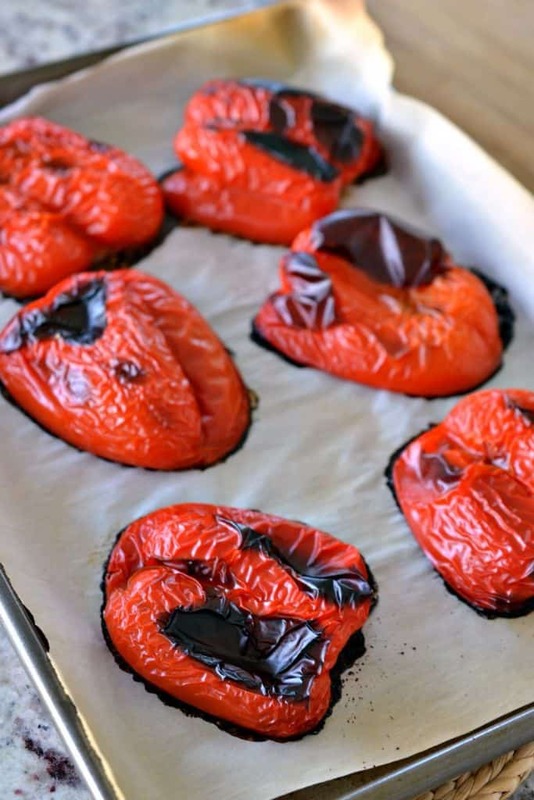 What recipes can you use Roasted Red Peppers in? On top flatbreads and pizzas. 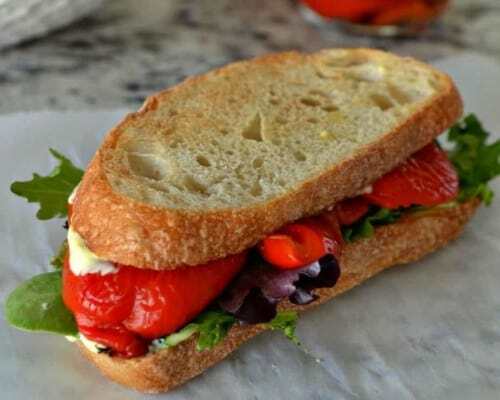 Fresh Roasted Red Peppers are so full of flavor that the possibilities of uses in recipes are endless. They are delicious right as they are with just a little salt and pepper. Pick up some red peppers today and enjoy all the delectable sweet fruity flavor of fresh roasted bell peppers. 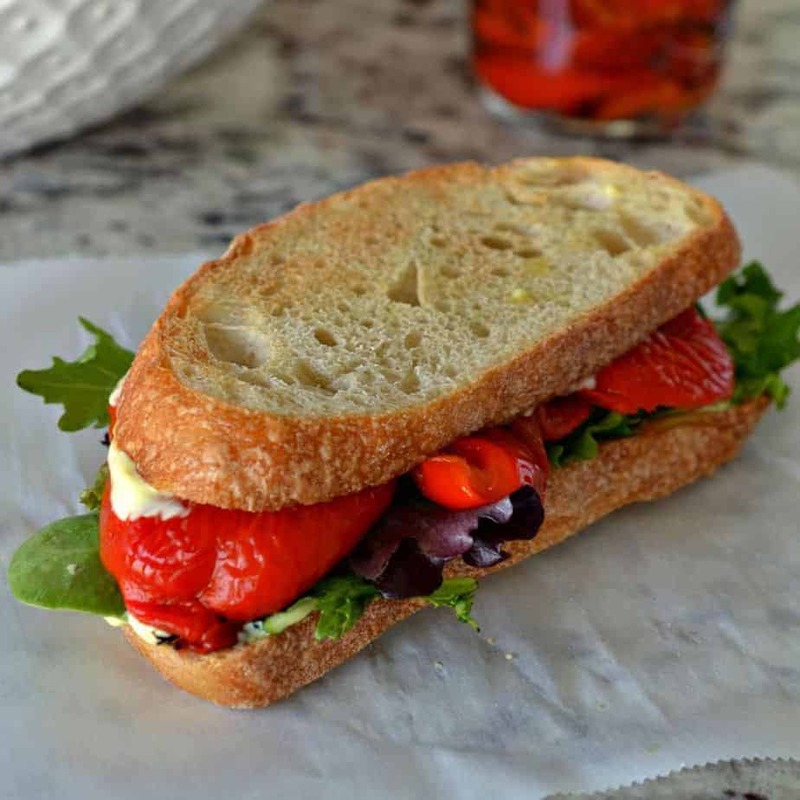 More Roasted Red Pepper Recipes you will love! 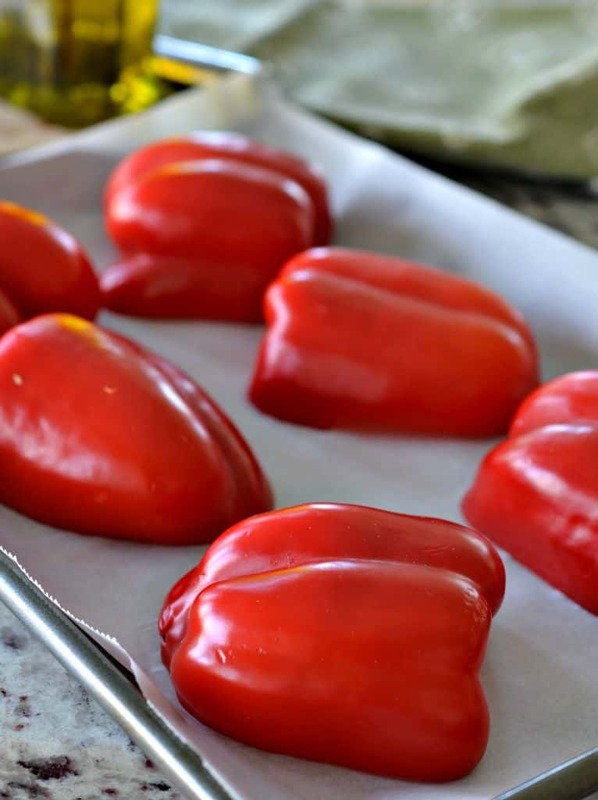 Fresh Roasted Red Peppers are so easy to make at home. These preservative free peppers are bursting with sweet flavor and zest. Cut red peppers in half from the stem side down. Remove seeds and membranes and place cut side down on baking sheet covered with parchment paper. Place in the oven and roast for 15-20 minutes or until blistered and black. Place in bowl covered with plastic wrap for 30 minutes. Pinch some of the skin and pull up on it. Once there is a break in the skin it will peel easily. 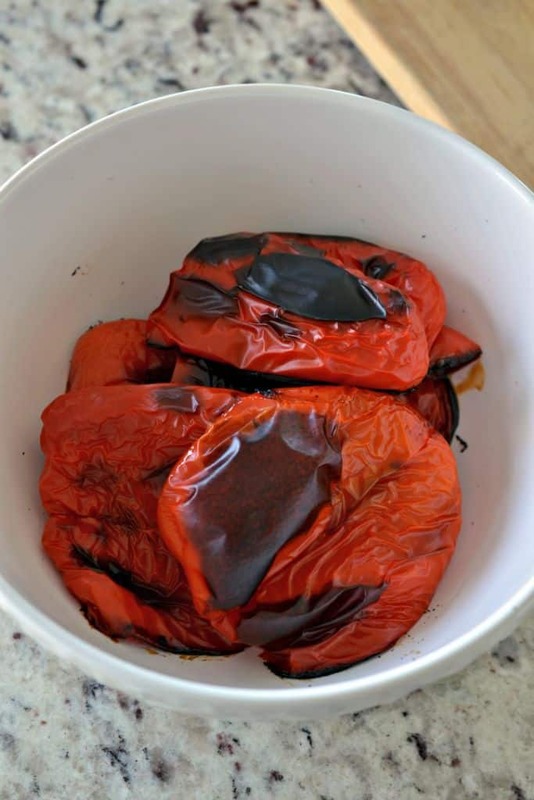 Discard the peels, cut roasted red peppers in half. Store in airtight container with olive oil drizzled over the peppers. I made roasted red peppers LAST NIGHT believe it or not and then here this post is! I didn’t think go make it into a sandwich, I was making pasta but that sandwich at the top looks delicious! Also, I think I did crowd them in the oven and that’s why they didn’t turn out EXACTLY as I wanted. Great post! I love roasted red pepper. They’re so good in almost anything. I have to make these, and I definitely will put them on a sandwich like this. It was great learning the difference between various varieties of pepper & learn the roasting technique. Thank you so much for sharing. I’ve been meaning to try and make my own roasted red peppers for the longest time! I love using them on my sandwiches, or even cut up in salads. I’ll have to give your recipe a try. These look absolutely delicious! I am constantly using red peppers in recipes, but I have never roasted them like this. I”m going to have to give this a try. I’ve never been a huge fan of peppers by themselves. However, I LOVE the way you prepared them and served them! YUM! I like roasted peppers. I’ll try them as for how you prepare them. I love roasted bell peppers! I eat them on my salads, as a side with dinner, and although I haven’t tried it yet, it looks amazing on a sandwich! Great recipe! This is such an easy to follow recipe! I love red bell peppers so I’ll definitely make this tonight at home. I’ve never made these myself. I usually just buy them already made. I definitely have to try this! You make it so easy and fun to try. I do like the way my home smells when we do this. I have a special spot in my heart for hot foods and these good! I can’t wait to try this recipe out! I’ve never made Roasted Red Peppers before, but they look delicious! I would love to try these. I love putting roasted red peppers on food. I am pescatarian but I have more of a love for it now makes the food more savory.